Yesterday took an unexpected turn when we went in for a check up for Jen and the doctor started talking about how she should meet some of the doctors at the local hospital. We were listening to her and nodding our heads until she ended everything by telling us to go up to the third floor and pick up a phone on the wall and tell them Jen's doctor's name and they'd let us in. We thought this sounded okay until we realized that she meant to go do this right now. "Oh, so we're not talking about some appointment in a week or two, you want us to leave here and go immediately to the hospital?" Let it be known that there was nothing actually wrong. They just saw a few things that they wanted to monitor to make sure that there'd be nothing wrong in another month or two. So Jen spent the entire day from 9:00 AM to 4:00 PM lying on a bed with two heart rate monitors (one for each baby) and getting her blood pressure automatically taken every thirty minute. We got a snack and I got to go get us lunch from the hospital's cafeteria: the most tragically confusing assortment of counters, menus, and extremely unhealthy food offerings I've ever set eyes on. If food is going to be that unhealthy shouldn't it at least taste good? The highlight of our day was catching Eat, Pray. Love on TV. When we got home we were, once again, forced to make do with whatever we had lying around as we once again did not have time to grocery shop. 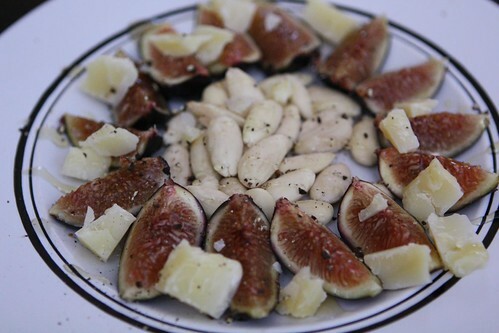 I had bought these figs for Easter then forgot to put them out so I plated them up with some blanched almonds, Toma Celena, and drizzled it with a little honey. 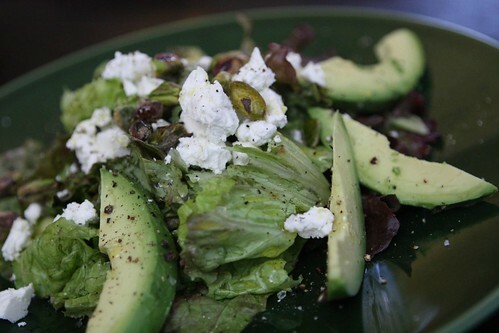 For salad I cleaned some red leaf lettuce and served it with sliced avocado, crumbled goat cheese, and pistachios. 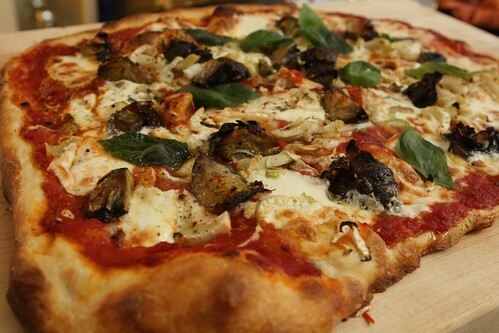 Pizza, my second favorite dish to use up whatever crap we have lying around (after pasta), was made with grilled artichoke hearts, sliced fennel, and whole basil leaves. Jen had been craving pizza ever since she saw a photo of some delicious pizza while eating the hummus and pretzel snack pack provided by the hospital. Watching Julia Roberts eat a whole pizza during Eat, Pray, Love. didn't help. 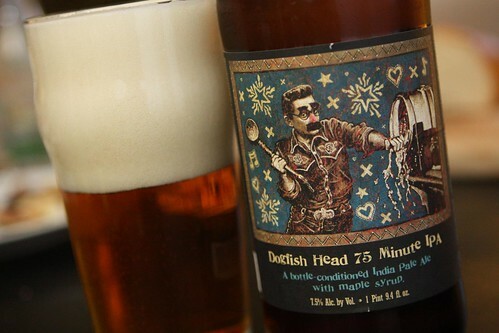 For a drink I cracked open this 75 Minute IPA from Dogfish Head. I'd picked up a couple of bottles a week or two ago after finding them at a local beer shop and I've been eager to taste it especially after hearing from multiple sources that it was Dogfish Head's best minute-themed IPA to date! It was a very nice beer but I may still be partial to the 90 Minute IPA. 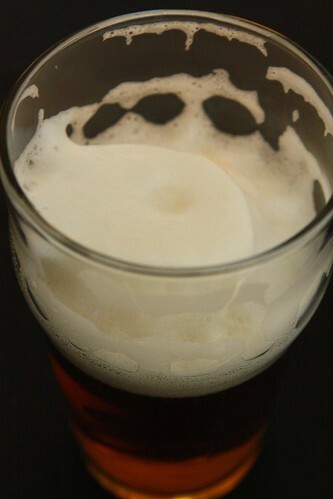 As you can tell from the picture it had the most incredible head of any beer I've ever poured. After five or six minute the head had only partially diminished leaving this pillowy foam behind. It had the consistency of egg whites whipped to a soft peak. You have to either be very patient to drink this beer or just prepared to have a foam-covered nose during the entire glass. 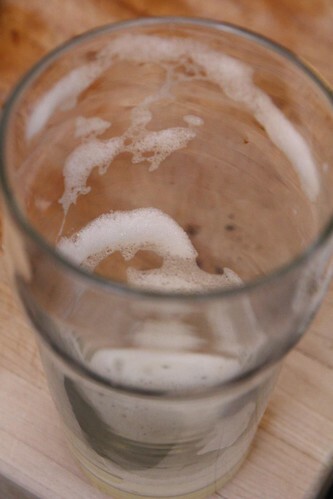 Even after finishing the beer the glass was covered in meringue-like foam all the way down the glass and leaving a solid floor of head on the bottom of the glass. It was quite remarkable. Maybe the particular yeast used were just really fond of maple syrup. I didn't get a ton of the maple flavor until toward the end when it had warmed up a little int he glass. So far after the 60, minute and 90 minute I find the 75 Minute to be right in the middle of the pack. So, by that logic, the more minutes the better! I currently have six bottles of 120 minute aging in my "beer cellar." Even though I'm terrified of the 18-23% alcohol content, if this logic holds it will be the best of all. I just haven't found a day where I feel comfortable having the equivalent of four beers. It's too scary because I am too much of a wuss.